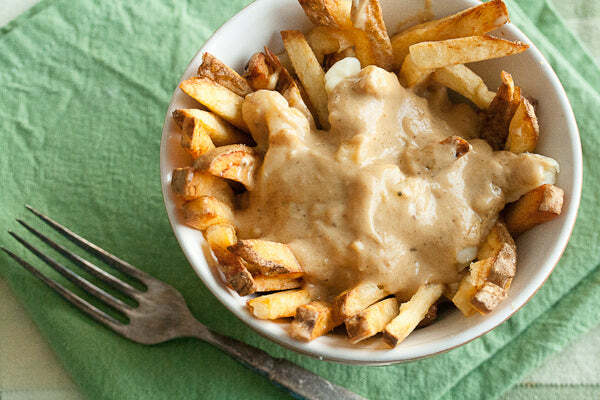 Poutine may very well be Canada’s unofficial dish. 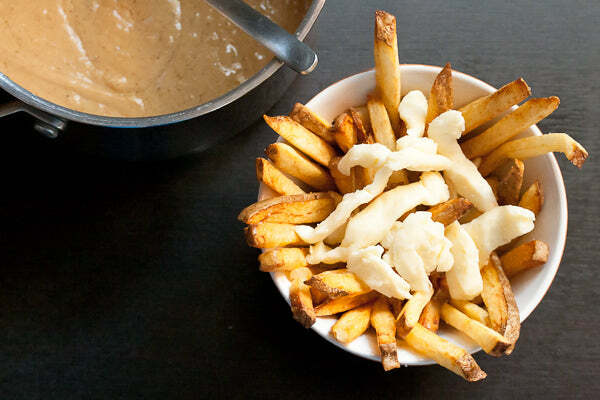 Originally concocted in a Quebec greasy spoon in the 1950s, the now-legendary combination of crisp French fries topped with cheese curds has found its way onto menus coast to coast, from fast food joints to high end restaurants. 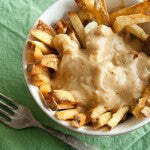 There are even restaurants with an all-poutine menu that serve up endless variations on the theme, including some rather intriguing multicultural variations like Greek, Italian and Butter Chicken. 1. 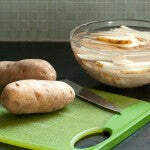 Cut the potatoes lengthwise into ¼” slices, then cut each slice into ¼” sticks. 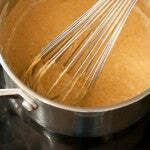 Transfer to a large bowl of ice water to soak for at least one hour, or up to 8 hours. 2. When almost ready to serve, heat oil to 325°F in a large pot set over medium-high heat (or in a countertop deep fryer). 3. 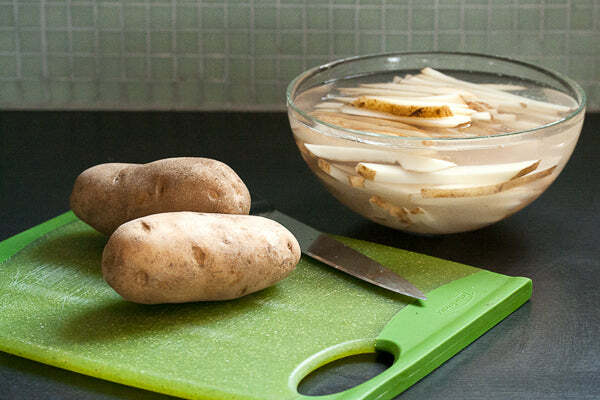 Using paper towels, pat the potatoes completely dry (make sure to be very thorough – wet potatoes equals splatter). 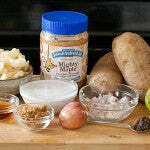 Working in small batches, fry the potatoes for 3-4 minutes, or until lightly browned and still very soft. Remove from oil and transfer to a baking sheet lined with paper towel to drain. 4. Increase the oil temperature to 375°F. 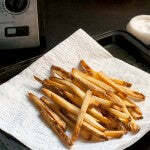 Still working in batches, return the fries to the fryer for 3-4 minutes longer, or until crispy and golden brown. Remove and set on a fresh layer of paper towels to drain. 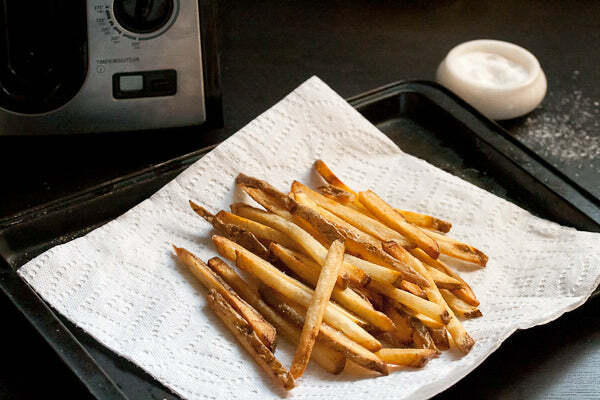 Sprinkle the fries generously with salt as they come out of the fryer. 5. 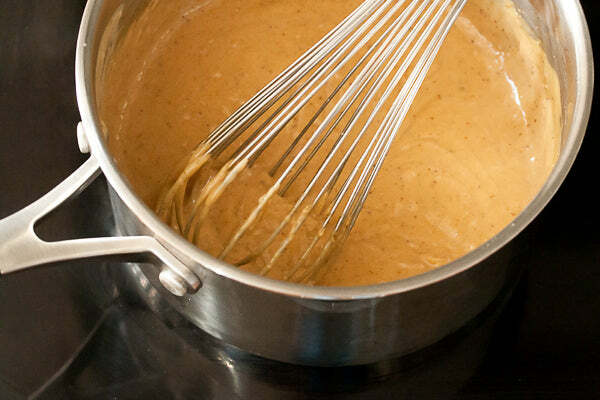 Transfer to a 250° F oven to keep warm while you prepare the satay sauce. 1. In a medium heavy-bottomed saucepan set over medium high heat, sauté the shallots in oil for 3-5 minutes, or until translucent and soft. Stir in curry paste and continue cooking for 1 minute, or until fragrant. 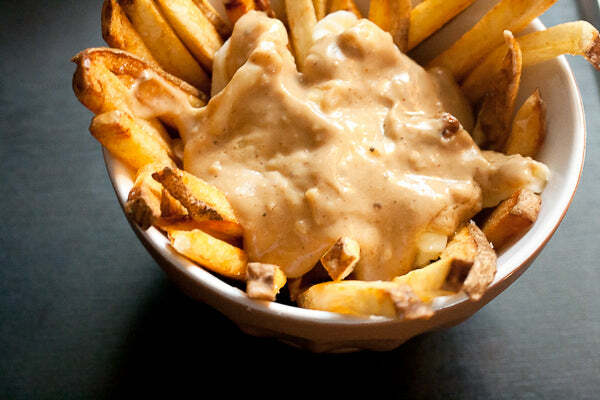 Divide the fries between six large bowls. 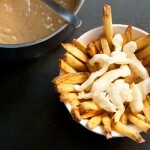 Top each one with ¼ cup of cheese curds, then pour a generous amount of satay sauce over top. Garnish with a sprinkling of cilantro, then serve immediately. 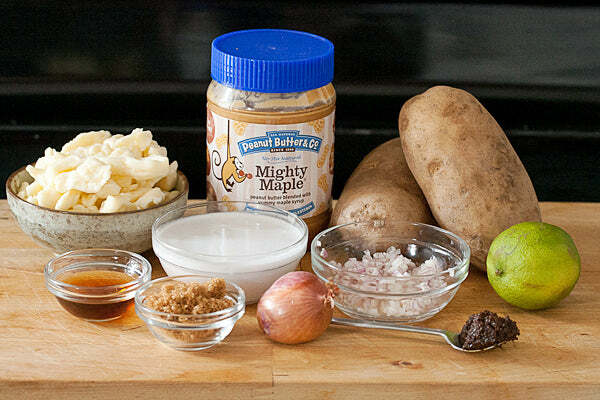 What else would you top Isabelle’s satay sauce with? – The giveaway is open to USA residents only and will run until Monday, July 1 2013 at 11:59 PM EST. – Winner(s) will have until 07/04/13 to claim their prize or we will choose another winner. 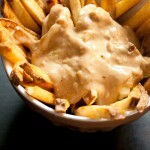 The post Maple Peanut Butter Poutine appeared first on - Peanut Butter & Co. Recipe Blog.